If you’ve ever visited a Chronic Tacos location, you’ve probably noticed its authentic and lively design and decor. But, did you know that the interior decorations are actually inspired by authentic interpretations of Mexico’s Day of the Dead, or Dia de los Muertos? The original and interpretative artwork that covers Chronic Tacos locations serves as an homage to the very place that inspired the Chronic Tacos concept and menu. Here we explore the history and significance of this holiday and its impact on art and pop culture. Every year on November 1st and 2nd, the entire country of Mexico and many other surrounding Latin American countries enjoy lively Day of the Dead festivals, parties and parades. But just what does this holiday celebrate? Dia de los Muertos is the Mexican holiday honoring the dead, combining indigenous Aztec rituals with Catholic traditions that immigrated to this region by Spanish conquistadores, according to National Geographic. Instead of mourning over the dead with sadness and sorrow, this holiday instead celebrates the lives of the deceased with festivals and lively celebrations, including food, drinks, parties and other activities. It is in Mexican folklore that on this holiday, the dead are awakened from their eternal sleep and rejoin their communities, joining in these celebrations with their friends and family. To welcome their deceased friends and family, the living decorate altars with candles, sugar skulls, marigolds, and food and drinks that their loved ones enjoyed – serving as offerings. Common symbols associated with this holiday are the calacas, the skeleteon, and the Calaveras, the skull. These images are plastered on everything during the holiday season — in decorations, parade masks, dolls, candies and more. Differing from the similar holiday, Halloween’s, decorations where ghosts, zombies and supernatural creatures are seen as haunting and scary, the skulls and skeletons on the Day of the Dead are always portrayed as enjoying life, such as dancing, smiling and wearing fancy clothes. As many Mexicans started to immigrate to the United States, Americans have slowly been exposed to the celebratory holiday and many have become captivated with its decorative images and traditions. Images, such as the sugar skull and skeleton, that have long been associated with Dia de los Muertos has been utilized and adapted by many artists, bringing them to the forefront of American pop culture. Today, the sugar skull can be found on t-shirts, iPhone cases, wall art and many people even choose to paint their faces for Halloween to actually become the a sugar skull. 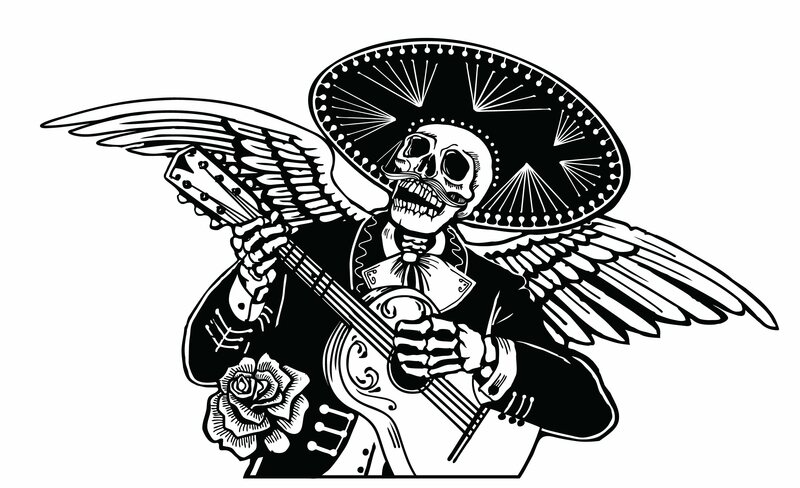 It’s safe to say that the symbols associated with The Day of the Dead are here to stay both in Mexican and American culture, and the Chronic Tacos location embellishments.